President James H. Ammons announced today that Florida A&M University will form an alliance with campus health care experts, researchers, and local, state and national organizations to address the Infant Mortality Crisis in Leon County. He is calling the group the FAMU Black Infant Health Alliance. During the press conference, the State Surgeon General of the Florida Department of Health Ana M. Viamonte Ros pledged her support of the initiative. "We are pleased that Dr. Ammons has step forward to address this matter," said Viamonte Ros. "We are committed to being a partner." Ammons says the high infant mortality rate among African Americans threatens the stability and future of African Americans. He wants to bring campus health care professionals and others on campus together to strengthen FAMU's impact and efforts to address this crisis. He would be relying heavily on the College of Pharmacy and Pharmaceutical Sciences, the School of Allied Health Sciences and the School of Nursing as resources. "In as much as this crisis is in the shadows of the Florida A&M University community, we feel that it is our duty to engage all relative departments at the university and others with great interest in addressing this crisis," said Ammons. "We will join forces with state, national and local organizations and coalitions to develop strategies that will address this crisis. Infant mortality is a crucial issue that the university must embrace. We want to take the lead and have impact." Ammons has asked Cynthia Hughes-Harris, dean of the School of Allied Health Sciences, and Dr. Joseph Webster, of the Webster Surgical Center in Tallahassee, to co-chair the alliance that would convene a think tank in January. The think tank on "Health Care: Infant Mortality Crisis in Leon County" will bring members of the alliance together to identify resources and develop goals and objectives. Dr. Ammons believes this alliance will be able to develop a plan that will be effective in addressing the crisis. "Community leaders, healthcare professionals and county leaders have expressed there is indeed a crisis and a solution to this problem is imperative," said Ammons. "Although there are no immediate answers to the high rate of infant mortality in Leon County, this alliance will be used to address and obtain viable measures to decrease the number of infant deaths in the county. If we do not assemble scholars to review a life and death issue affecting the future of our communities, then we would reduce the meaning and impact that an institution of higher learning should have in its community and state." Several organizations have agreed to support this alliance, including the Florida Department of Health, Tallahassee Health Equity Alliance Team, the Institute of African American Health, the Gunn Society, and Bond Community Health Center. Commissioner Bill Proctor has agreed to work closely with the alliance, as well as, Charles Evans, who will represent the State Chapter of the NAACP; Eunice Cofie, Miss Black Florida USA; and Dr. Nelson L. Adams, M.D., president of the National Medical Association. "FAMU has a right and obligation to take a stand," said Dr. Joseph Webster. "I commend Dr. Ammons for taking that stand and thank him for his vision. Today, we stand ready to lead this alliance." "There is a need to develop programs and coordinate resources," said Proctor. "The educational entities must become involved to improve health care access. The university will empower this initiative and find practical solutions to decrease the number of infant deaths in Leon County." PHOTO CAPTION: FAMU President James H. Ammons announces the alliance to address the infant mortality crisis. 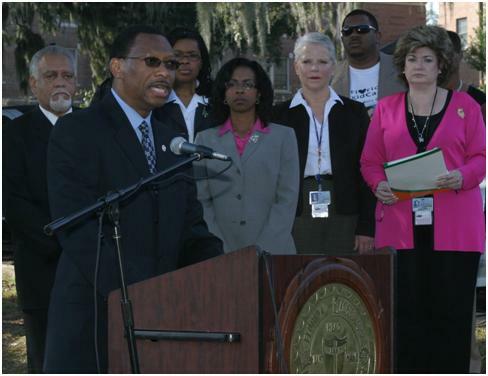 Supporters of the alliance include (from left to right) Charles Evans, president of the Tallahassee Branch of the NAACP; Yolanda Bogan, director of FAMU's Counseling Center; Fran Close, assistant professor of behavioral science and health education; Jean Kline, representative from the Florida Department of Health; Ed Dixon, county commissioner for Gadsden County; and State Surgeon General of the Florida Department of Health Ana M. Viamonte Ros. Today is World AIDS Day. Throughout the world, over 30 million people are living with one of the most deadly diseases --- HIV and AIDS. It is likely that you know someone who has contracted the virus or who has already died from it. Because of the stigma of AIDS, one of my cousins, passed away several years ago in loneliness and isolation from our family. Without giving us an opportunity to say a loving good-bye to him, his mother selfishly had him buried far away from us. No one else, not even his father, knew what happened to him. It is a pain that I still carry and anger that I have yet to overcome towards her. Not only did my cousin die a horrible death, he was also ashamed to disclose his homosexuality to the family. While I cannot fully understand how he must have felt, it was just another stupid attempt to conceal the obvious. I so want to say to him, "Hello cousin, tell us something we don't already know." I would have hugged him and told him that we love all of him even if we don't agree with his lifestyle. I just can't imagine the pain and loneliness he must have endured. It was all so unnecessary. I know that my cousin probably wanted to avoid the attempts to "straighten" him out. His lifestyle choice would have wrought the same lectures heaped upon the "wayward" relatives who choose to "live in sin" without the benefit of marriage. I love my family but some of their actions are as predictable as sunrise. All things considered, my cousin forgot how our family always has each other's back. He forgot that we don't always agree but we're always family. What is more ironic is that he could have learned that he was not alone; there are other members of the family that are homosexual also. What a sad end to a promising life. HIV/AIDS is not a homosexual disease so don't foolishly think you can't get it if you're heterosexual. Although HIV/AIDS is prevalent among blacks, you can get it if you're not black. Regardless of your ethnicity or sexual preference, you are susceptible to contracting HIV/AIDS if you engage in sexual activities, are an intravenous drug user or require a blood transfusion. If you are an infant, you can get HIV from the breast milk of an infected mother. Don't let HIV/AIDS break up your family and remember that no ever has to suffer through this disease alone. Most of all, to my cousin, I love you, man. Can you survive the journey of a child? The Experience is an interactive exhibit that will transport you to the heart of Africa ... and into the life of a child.